As most of you are aware by now, Qfarm command doesn’t run anymore in XenApp 7.x as it is a part of old IMA architecture. With FMA, there are several ways to check the Server load, the easiest being using Citrix Studio and checking Load Index. However, there is another method to check the load from using a PowerShell window and it is as below. Hope it’s useful for someone out there!!! Provide a single URL for application access for the users in all the sites, Auckland, Sydney and Manila. Any unique applications from both sites should be enumerated. How do we achieve the above? This was something that was impossible to do with Citrix Web Interface up to versions 5.4. Wait, there is some hope. Auckland XenDesktop site consists of XenDesktop 7.6 site alongside Storefront 2.6 cluster with 2 nodes and NetScaler 10.5 for GSLB. Let’s look at how each element should be designed to achieve the above stated requirements. I am sure this is quite new to a lot of people out there, at least for me it was. This is where Storefront comes in. Citrix has built some excellent intelligence around Storefront to achieve this quite easily. This feature is technically called Resource Aggregation. There is an good explanation on this from Citrix here which i recommend every one to read. The key for this to work is to keep the application and desktop names the same across both XenDesktop sites. The path of application executables must also match for this to work. if there are differences, then they will be shown up as separate applications. Also please note that AppController applications cannot be aggregated via this method. The idea here is to split the users into 2 groups and assign them a primary site – In the end, one group will have the primary site assigned as Auckland and the other with primary site assigned as Sydney. The key here is to add the users to separate AD groups for each sites and configure the XenDesktop sites/farms in a specific order (Manage Delivery Controllers in SF) and use the word “Failover” in Storefront configuration. I will get to this in detail in the Setup section below. Requirement 4 – Provide a single URL for application access for the users in all the sites, Auckland, Sydney and Manila. Requirement 5 – Any unique applications from both sites should be enumerated. This is already explained in parts under Requirement 2. If there is a case where any unique applications are to be delivered from one site for all the users, all that is required to be done is to publish that application in the relevant site. The application will appear when the enumeration is done and clicking it will take the users to the site from where the application is published. This use case is relevant when there are 2 or more applications with the same name across datacenters and you would need your users to always go to one datacenter to launch it. if the application isnt available at the primary datacenter, then it will be launched from the secondary datacenter. This is done by adding “Primary” and Secondary” keywords in the application description. Doing this will override the application load balancing/Failover rules specified above and will attempt to launch first from the Primary site. if the primary site app isn’t available for any reason, launch it from the Secondary site. All the configurations are made in Web.Config file residing on the Storefront servers. Please also note that the changes must be made to the config file of the Stores and not the Web version of the Stores. 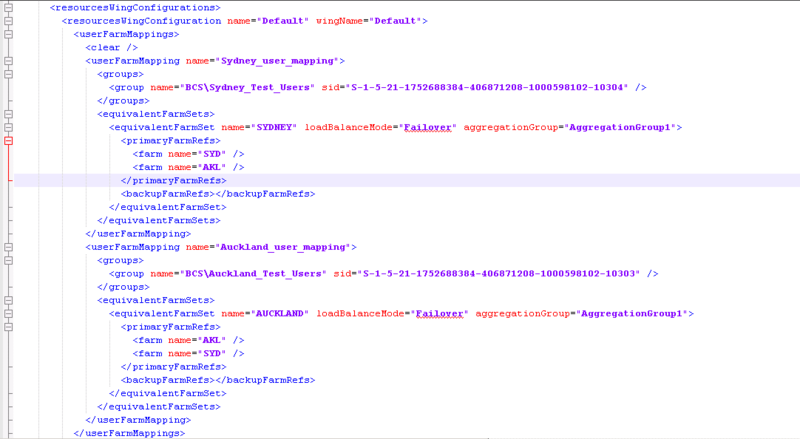 I recommend using XML Notepad as it makes the Web.Config file look ridiculously simple. Create the Store as you usually do via Storefront Console. Update the information under “Manage Delivery Controllers”. Also ensure that you add the secondary site info as well in here now. This piece is very important in the process as the names that are used here will be reused in the Storefront configs later on in the Web.Config file. 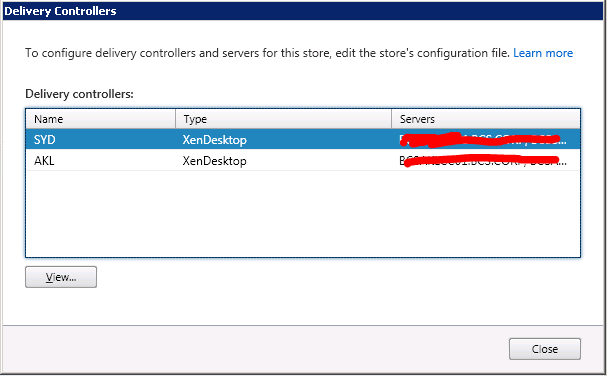 Once you make changes to Web.Config file, you cant change the “Manage Delivery Controllers” section via the GUI anymore for that store. My Sydney Storefront cluster store will look like this after configuration. Please also refer the order of the sites – very important. First one must be Sydney followed by Auckland. Those who have keen eyes must also have noticed that the “Edit” button is missing from the above. This is the file after the changes are made. My Auckland Storefront cluster will have the above settings reversed. 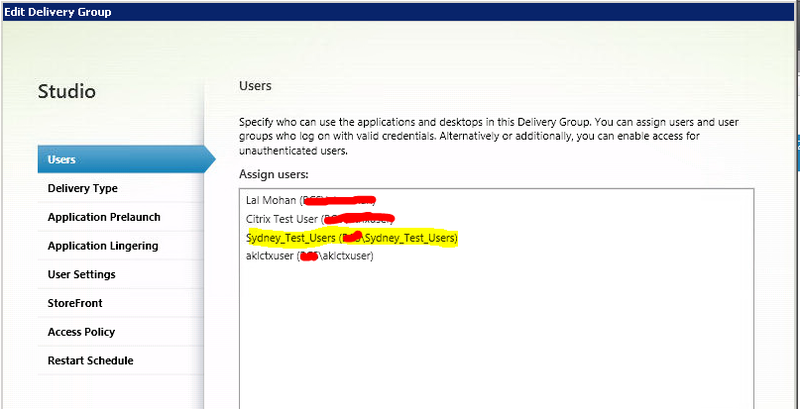 Now create 2 AD Groups – One to host Sydney users and another one for Auckland Users. Add the users accordingly to it. 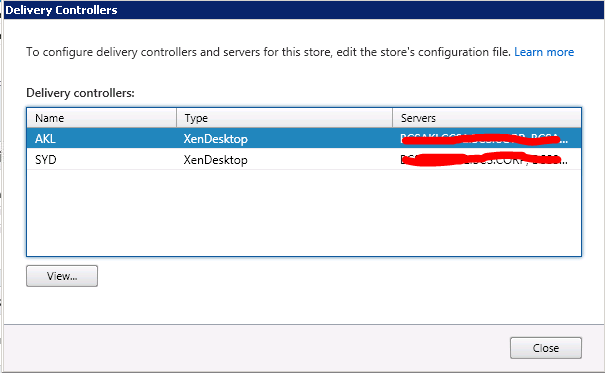 All StoreFront store configurations can be found in the respective web.config file .\inetpub\wwwroot\Citrix\\web.config. This is where we add the configuration for StoreFront High availability. For convenience, I made a backup copy of the web.config file before making any changes. As you will be making a lot of changes it is much simpler to edit the file direct on the server and not have to keep copying it back and forth to your machine each time. Then right click citrix.deliveryservices and click paste. 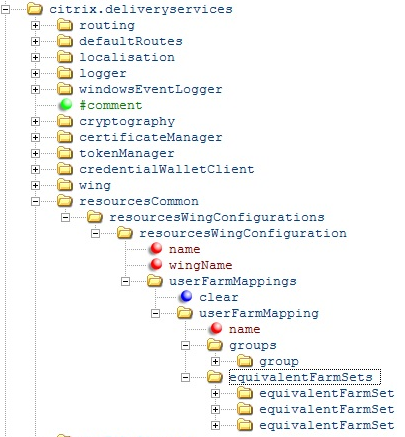 Delete 2 references to “equivalentFarmSet” under the node “equivalentFarmSets” and the config file should look like the below. You would also need to remove one “farm” and a backup reference. Overall It should look like the below. If it doesn’t, you are not going to achieve what you need. 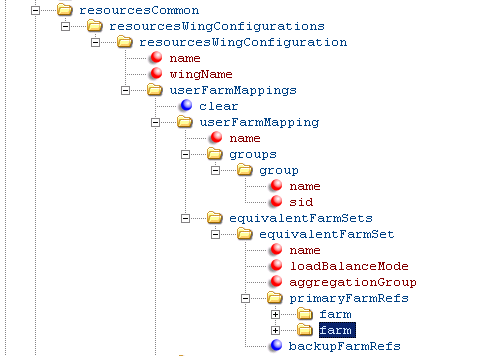 Now start populating the data values on the right and mine looked like the below after the config. The ones marked with red dots are descriptors so you could add what you like there. This is the final configuration below for the Sydney Storefront cluster. Save the Web.Config file. Close the file. 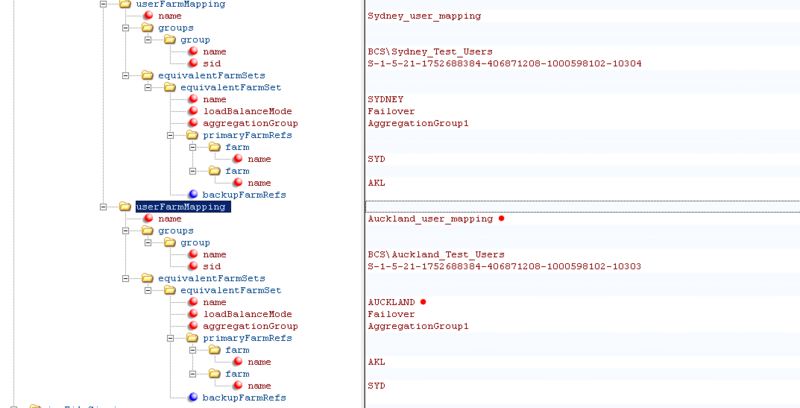 Make sure that the changes are propagated to the other SF servers in the Sydney cluster using the GUI. Just reverse all the settings that are made above and to those who are still confused on how it all should look like at the other end, below are a couple of screenshots from Auckland side. 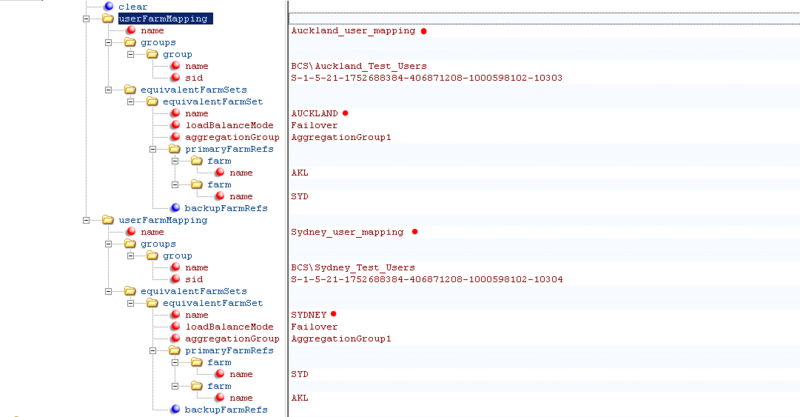 Add the Auckland_Test_Users AD group to the Delivery Group in Auckland site. 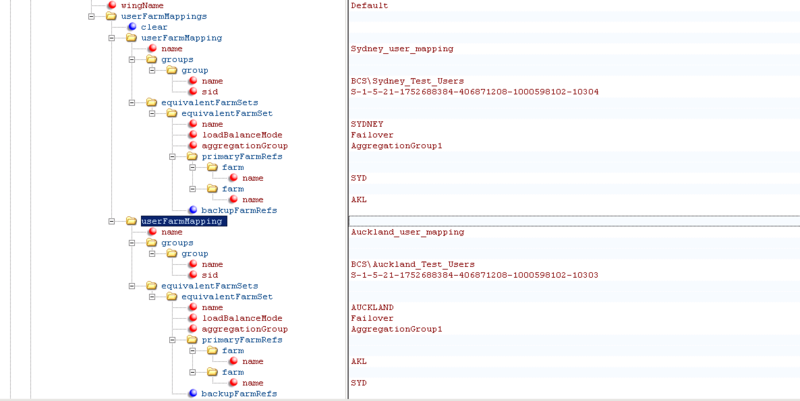 Please note that the Auckland account is added for failover. Use the second Auckland group in here in a production setup.